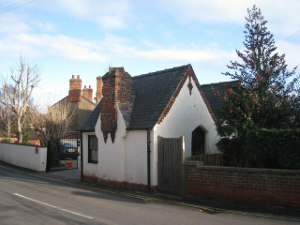 Solomon Fenner lived in the village of Laceby in Lincolnshire England in 1710. Fenner had briefly served in King William and Queen Mary’s army then he returned to his home to work as the village blacksmith--a trade he had apprenticed in as a youth. He was not wealthy but he made a comfortable living. He was known in Laceby as a pious man who attended church each Sunday. He gave what he could to the parish poor. Solomon unmarried and in his 30s became enamored with a young woman, Rebecca Petitt who lived in the neighboring market town of Caistor. Rebecca was widely admired for her long red hair and lovely green eyes. Her beauty plus the fact she was witty had guaranteed she had plenty of suitors. Rebecca’s father William Petitt had rejected all offers of marriage for he had plans to make a more advantageous match. Petitt was a greedy man who owned several shops in Caistor. His goal was to accept a son-in-law who would also benefit him financially. Solomon Fenner showed up at the Petitt’s doorstep one Sunday afternoon to ask William for his daughter’s hand in marriage. William not only rejected his offer he had his servants throw Fenner out onto the street. Over the next week, Solomon normally a calm man let this rejection fester. Bitterness overtook him and he snapped. He knew Petitt’s habit every Saturday was to visit a friend in Cabourne a hamlet that lay between Caistor and Laceby. Petitt would return home late at night after an afternoon of gambling and drinking. The next Saturday Solomon seeing “red” lay in wait in the shadows. When Solomon spotted Petitt staggering down the Lincolnshire road he leapt out and bludgeoned him to death with his hammer. Solomon calmed down and looked down at his bloodied hands, he realized it was too late. He ran to a nearby farmhouse and woke the inhabitants. He tearfully confessed what he had done. They detained him and sent for the authorities in Caistor. They discovered Petitt’s bloody and battered body and knew Solomon Fenner was telling the truth. The night before Solomon was hanged he expressed fear for his immortal soul. 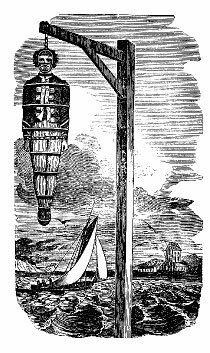 His body was gibbeted on a hill that overlooked Cabourne--and the scene of the crime. 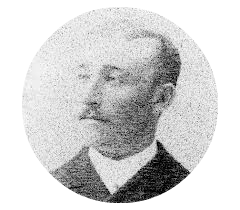 Since, a legend states that Solomon Fenner has not found rest. According to Lincolnshire folklore, the ghost of Solomon Fenner approaches travellers who walk between Cabourne and Caistor late at night. He is described as tall and robust as he steps out of the shadows wearing dirty clothes and carrying a bloodstained hammer in his hand. His eyes are red from weeping. In shades that remind one of The Rime of the Ancient Mariner his ghost then confronts these travellers. He reassures them that they have nothing to fear for he will not harm them. He then tells them the story of his crime. He reminds them that all life is sacred. It seems his punishment for taking a human life is to spend eternity telling others his crime. In the summer of 1993 a Canadian couple went on a camping trip to Alaska. 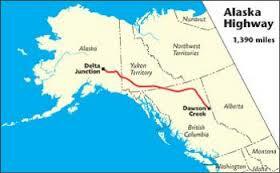 On their return trip they decided to drive back on the Alaska Highway--better known as the Alcan Highway. Driving this highway today is still an adventure even though the road is paved. Divers need to watch out for the “frost heaves” that are caused by seasonal freezing and thawing on the ground. These cause a rough ride. Loose gravel and dust also still pose dangers, such as broken windshields. Sections of this narrow winding road do not have shoulders. Drivers need to keep their headlights on so oncoming traffic can see them. They also need to monitor their fuel for small towns along this 1,390-mile highway are sparse. 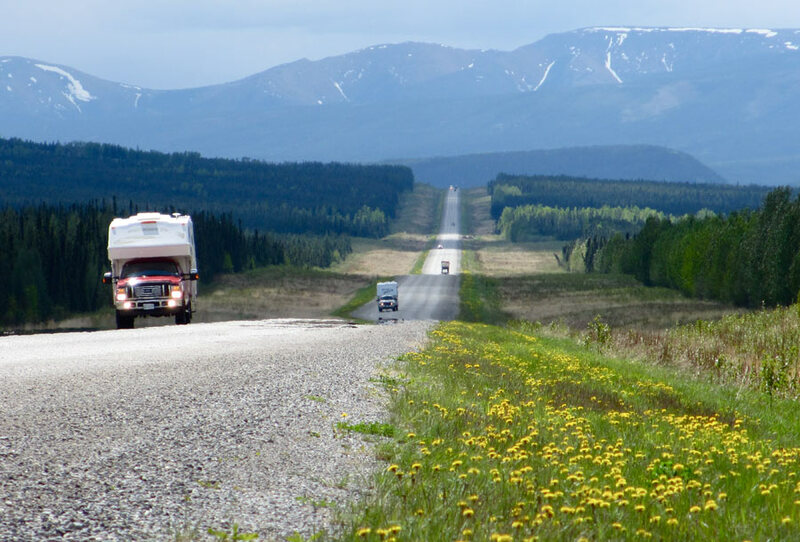 This couple, were driving on a northern section of the Alcan in British Columbia when they saw something so strange the husband still will not talk about it today. They were enjoying the untouched wooded scenery they were passing through when the wife spotted a dozen black bears eating berries just off the side of the highway. As her husband slowed down to take a closer look she stated it was a good thing their truck was in good shape for one would not want to have engine trouble in this isolated area. Her husband, an avid hunter had remarked on the other wildlife they had spotted during their drive, which included: a grizzly, deer, bighorn sheep and caribou. Further down the road she was surprised to see a man, a Native American standing just off the highway. There was not another vehicle in sight. He had long hair, appeared to be in his 40s or 50s and was wearing a hat. He was just standing there--he did not appear to be hitchhiking. What was even more unusual was just a few feet behind him stood a huge bull moose. 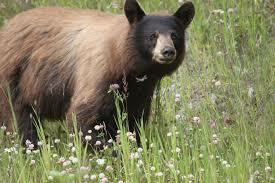 This animal was too large to have been able to approach him without being heard. Her husband had enthusiastically commented on all the wildlife they had seen that day but now he said nothing. When she tried to talk to him about how odd this scene was and even joked that maybe the man had ridden in on the moose--her husband was not amused. Several years have passed and he still refuses to talk about this incident. She mentioned he is a skeptic when it comes to anything paranormal. She on the other hand thinks they saw a ghost. If it wasn’t a ghost, it was by far the strangest thing she has ever seen. Local historical societies are a wealth of information when it comes to ghosts. These societies sometimes have ghosts of their own--this might be because they are often housed in old historical buildings. Many of them embrace these hauntings and even offer ghostly tours of their buildings. 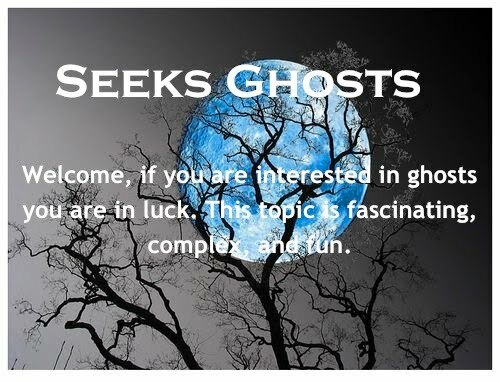 Other societies, familiar with their local ghost tales offer walking tours of various haunted areas. In a past post entitled, The Ghosts of the St. Francis Dam Disaster I wrote about a California historical society who offers unique ghost tours. 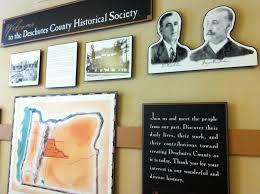 The Deschutes County Museum and Historical Society located in Bend Oregon is one society that is housed in a building with its own ghost. 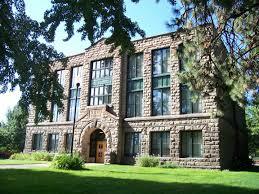 This museum also offers haunted tours of downtown Bend. The building where this museum and historical society is located is over 100 years old. Two brothers George and Ed Brosterhous were the contractors who supervised its construction in 1914. One Saturday, George was on the new building’s roof to supervise the delivery of needed materials. When he left he fell through a gaping hole in a staircase that was under construction. He fell 3 stories and died instantly. But his story does not end here. 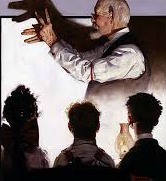 Over the years several witnesses have stated they encountered George’s ghost. Members state he has helped with research projects. They see him sitting quietly in one corner. In 2014, a concert pianist who was scheduled to perform in Bend, visited the museum. 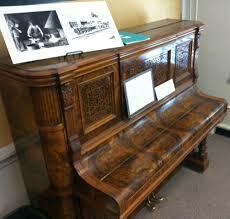 He sat down at an antique piano and began to play. An employee on an upper floor hearing the music came downstairs to listen as she worked. Confused this female employee stated they were the only two people in the room. Equally confused the pianist insisted there had been a man watching her. This photograph was a picture of George Brosterhous. 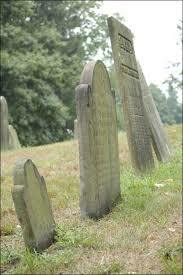 A paranormal phenomenon that is more common than many realize is phone calls from the dead. In another post entitled, Phone Calls From Beyond I share a story about a man who after being killed in a California commuter train accident then made phone calls to his fiancé and several relatives. There are many stories where people state they talked to a deceased relative or loved one on the phone. These often occur within a short time span from when the person died or on days that have specific significance like birthdays, holidays or anniversaries. These calls are always from someone who was very close to the recipient. The purpose for them varies but most often they are to say a final farewell or to lend comfort to those left behind. In other instances they are used to send a specific message or to warn the living of impeding danger. 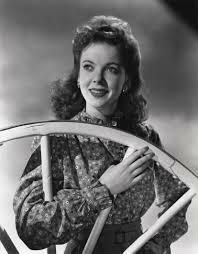 A well-known 1930s and 40s actress, Ida Lupino later became one of Hollywood’s first female directors. Here is her story. Six months after my father died I received a phone call from him. He told me where I could find some important papers that I needed in order to sale his house. Sure enough I found them exactly where he said they’d be. Some of these phone calls take on a twist or added dimension. The following story fits in this category. This caller did not know the person on the other end has already died. 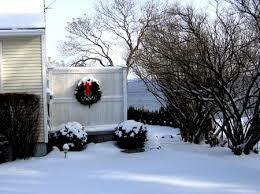 It was to be the first time Ginny would not be home for Christmas. Her father lived in her home state of Maine and she now lived in California. She had arranged to call her Dad on Christmas but a feeling that something was wrong overwhelmed her. The two then had a nice long conversation and Ginny hung up feeling relieved. That afternoon a Maine state policeman called her. It slowly sunk in that he was telling her the truth. Her father had passed away. When he had told her “I have never felt better.” It was because he was no longer bound by the many ailments that had plagued him in life. Her Dad had somehow managed to have one last conversation with her. This is a 1st person account of a disturbing encounter with a ghost who tries to harm a group of college students enjoying the holidays. My friends and I decided to spend our school break in Scotland. On a budget we decided to camp. Since it was too cold to use out tents we rented a caravan. On our second night at our campsite we decided to hike over to a nearby village pub. One friend, Sam was feeling under the weather so he decided to stay behind to rest. As we entered the pub we realized that we did not have enough money so I volunteered to return to our camp. 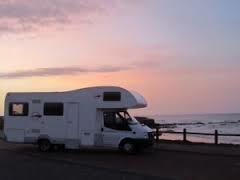 As I entered the caravan to retrieve my wallet strong gas fumes overwhelmed me. I was surprised to find the stove was on. I turned it off. I found Sam asleep in the back. He was oblivious to what was going on. I helped him exit the vehicle. Later that evening as the group discussed what I had discovered we became alarmed. It dawned on us that the gas being turned on could have been fatal for Sam. None of us were cooks and we would not have turned the stove on. Nervous now, we wondered who did turn it on. Sam chimed in that the night before he awoke to see a figure shutting the caravan ceiling’s pop up window. He did not mention it before because thinking it was just one of us he went back to sleep. But now as he thought about it this figure was standing on a stool so it could reach the window. All of us were tall enough to reach this window without the aid of a stool. We concluded that this mysterious man must have been responsible for the gas being turned on as well. The next morning still unnerved we decided to move on. As we drove down the country road that led to the pub we stopped. We told the landlord our strange story. He was not surprised. He told us the locals considered the area around our campsite to be haunted. He told us a group of college students similar to our group had stopped at that campsite just the year before. As they walked down the country road to his establishment they had encountered a young man. They spoke to him but as they neared the pub this stranger had just disappeared. They looked around but there was no trace of him. In 1991 Mandy was donated to the Quesnel & District Museum located in British Columbia. Today she is the main attraction at this museum. The owner that donated Mandy to the museum felt uncomfortable owning this doll. She kept Mandy in her basement with a variety of other antiques. She started to hear strange sounds coming from her basement but when she would go down to investigate nothing seemed out of the ordinary. She became scared when she began to hear what she described as “a baby crying” coming from her basement. Although she investigated this sound on many occasions she never discovered the reason for these sounds. As this noise became more pronounced and louder she became convinced this doll was haunted. She decided not to keep it. Not wanting to throw this antique out she donated it to the museum. After the doll had been removed all the strange sounds stopped. Once Mandy was displayed in the museum strange things started to happen. Staff lunches began to disappear out of the refrigerator only to be found later stuffed into various drawers around the building. Employees’ personal items, such as photos, pens and books would disappear without a trace. 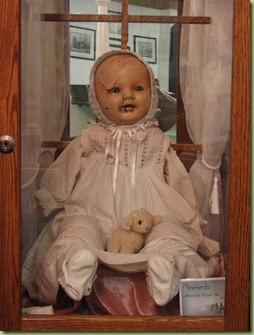 At first, the museum displayed Mandy in a case near the entranceway but several guests complained that they got a strange vibe from this doll so Mandy was moved. This doll's cracked and broken face added to these negative feelings. Visitors often stated that she "has a sinister smile." One legend states she then was placed in a case that contained other dolls. But when staff began to find these other dolls damaged rumors spread it was Mandy. It seems she was jealous. Mandy eventually was put in a corner in her own case. 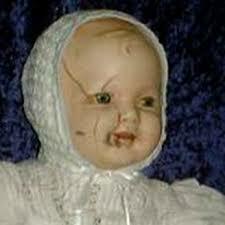 This strange doll was featured in a book entitled Supernatural Stories Around British Columbia. After this more people started to visit the museum just to see Mandy. Other odd activity was reported. Visitors stated that their camera and phone batteries would drain while they stood near Mandy’s glass case. Photos taken of Mandy sometimes would turn out but in others the photos were blurred. It appears Mandy is picky about who can take her picture. One female patron stated her camera’s light flickered constantly until she left the room that contains the doll. Other creepier reports include people noting this doll’s eyes followed them as they moved around the room and that just as they looked away from her case they saw Mandy’s eyes blink. Employees' state Mandy--regardless of the case she is placed in-- has mysteriously moved positions. All these reports have guaranteed this doll has a sinister reputation. 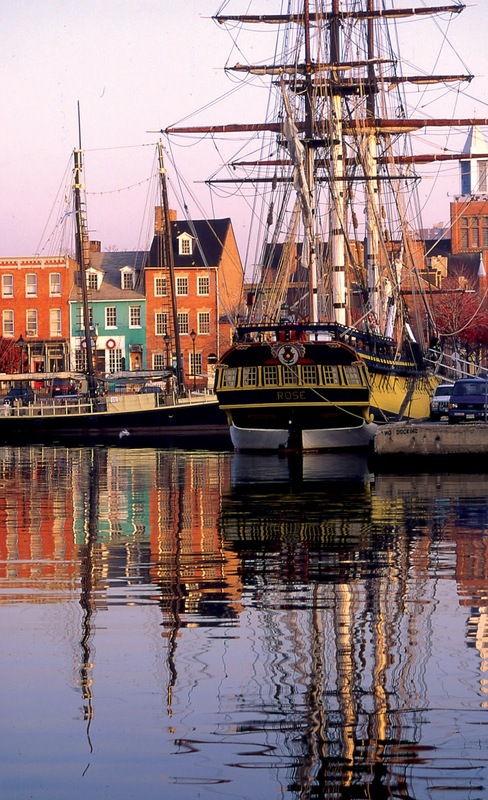 Sitting on a picturesque peninsula in Chesapeake Bay is a small community called Fells Point that still embraces its roots. 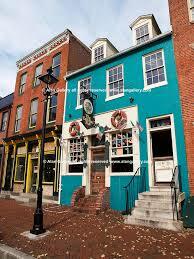 Fells Point today is lined with quaint 18th and 19th century homes and storefronts. This area today hosts several trendy bars and restaurants. 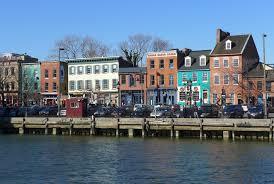 Fells Point made a good port because its deep waters almost reach the shoreline. It was Baltimore’s main port for over 100 years. 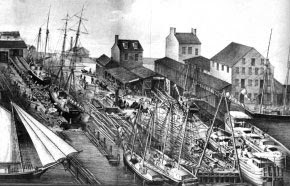 It original residents were the rowdy seamen that visited this port along with the working class citizens of Baltimore. They frequented the pubs and brothels that were located near this port. This rich history is why many believe this area is haunted today. Most of this ghostly activity occurs in the pubs and along the streets in this small port community. The Cats Eye Pub was also a brothel in the early days. 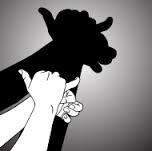 It used a “red light switching system” that was common in establishments that provided its customers with prostitutes. This system was a board with several red light bulbs. When a Lady of the Evening would flip her switch off it signaled she was not available. When she was ready for her next client she would flip her red light bulb on. This switching system is where the term Red Light District comes from. Today the renovated Cats Eye Pub is still used as a bar. A recent employee, Paige McClain states this old switching system was covered up by dry wall when the building was renovated. She and several other employees believe the spirits of these prostitutes haunt this pub. The old switching system is located just below the ceiling near the front of the bar. Both employees and patrons have heard these switches engaging and disengaging in this area. This pub is located in a building that once was a row house. At one time it had a second floor. In the early days once it was converted the owner decided he had no use for the second floor so he had the staircase removed. Today, patrons at the Whistling Oyster report seeing an apparition ascending this staircase, which no longer exists. The original owner of Fell’s Point is also said to haunt this peninsula. A man dressed in 18th century clothing has been seen by several recent residents. Coby Kay Callahan and her boyfriend Christopher Carter were heading home at 2:30 a.m. when they spotted a strangely dressed man walking into an alley up ahead. When they reached the entrance to this alley no one was in it. Their sighting is not unusual. Several other witnessed have reported seeing this ghost. He is seen late at night--normally after the bars have closed--walking along various streets in Fell’s Point. It is said that this was probably his habit while alive. 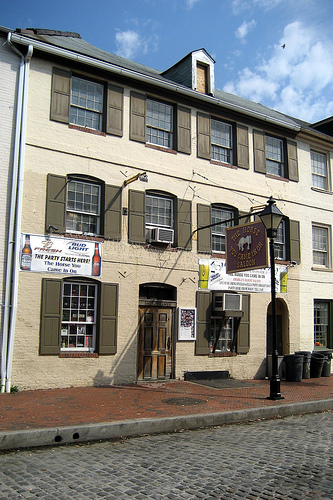 Another haunted pub located at Fells Point is The Horse You Come In On. This pub is located on the last street before you reach the dock. 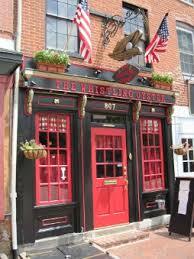 It is believed this was one of Poe’s favorite places to drink. I talk about this pub and several other places Poe’s ghost is said to haunt here. Employees of this pub blame Poe’s ghost for several strange occurrences that happen in this bar. One female bartender while preparing to open for business states that when she walked up to the cash register it opened on its own. She closed the drawer and went about her business. When she returned to the area she was surprised to see the drawer open once more. She again closed it. After this it opened several more times. At the end of her shift when the next bartender arrived she told him what had happened. He was not surprised. He informed her that it was just Edgar, their ghost. He told her the cash register drawer opening on its own was a common occurrence. This female bartender found out quickly that if she talked to Poe and acknowledged his presence the activity slowed down for a while. Our grandfather was a war veteran. He fought for the North during the War Between the States. My twin sister and I had since the age of 5 spent All Hollow’s Eve at his home. All 14 of his grandchildren would attend these parties. We would play games, eat sweets and have the best time of our lives. These evening were made extra special for we were allowed to stay up way past our bedtimes. Tired from all the excitement at the end of the evening we would gather around Grandpa as he sat rocking and smoking his favorite pipe. A hush would fall over the room as we waited in anticipation. He knew what was expected but he always acted like he didn’t have a clue. 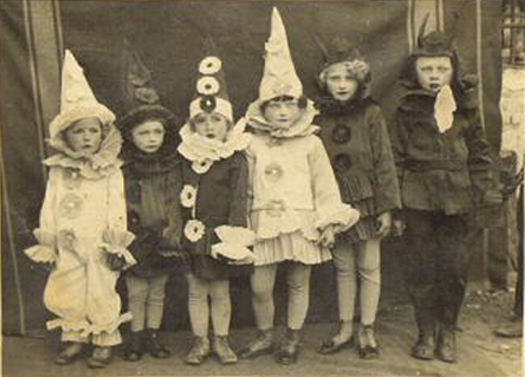 This banter would continue for awhile, us begging and Grandpa making excuses but we all knew that he would relent eventually for every Hallowe'en he told us a ghost story. After we had all settled down and were sitting still, Grandpa started to talk in a quiet tone. We leaned forward so we would not miss a word. “I guess since you are all older now it is about time I told you a true ghost story.” We nodded solemnly in unison agreeing that we were certainly old enough. Several of us gasped for Grandpa had never said before he had actually seen a ghost. It was one night while I was on picket duty. I was out in the open but there was a thicket of trees near where I stood. 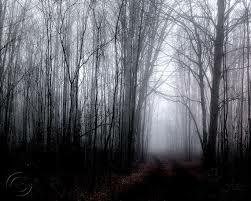 It was dark and in the middle of the night when I first saw the ghost, glowing white standing at the edge of the woods. I didn’t think anything of it at first--you tend to see strange things in the army. Seeing a little thing like a ghost didn’t bother me. After awhile the ghost just disappeared. This did make me pause since it had vanished right before my eyes. A brief span of time passed then it appeared again--but this time it was closer. The ghost just vanished once more. It then proceeded to appear and disappear several more times--each time it came closer to where I stood. I can tell you I was nervous now. Hearing this, I felt shivers run up and down my back. Grandpa continued. I wanted to run but I was on duty and couldn’t leave my post. I had to stand there and watch this ghost come closer and closer each time it appeared. I calmed down by convincing myself that it must be a rebel soldier in disguise. After all, the enemy--Johnny Reb-- was always trying to trick us. I now became afraid that if this imaginary soldier came close enough to me that he would run me right through with his bayonet. We all jumped as Grandpa acted this action out. Within moments an officer was standing before me demanding to know what had happened. How could I tell him that I had shot a ghost? He wouldn’t believe me. Well he didn’t believe me, he ordered another soldier to stand with me at the post until morning. As dawn broke I spotted a large white form. I went over to inspect it and discovered I had shot a fat cow. It was white on one side and dark red on the other. In the dark, when she turned her red side to me I couldn’t see her but when she turned her white side to me--well she didn’t look like a cow. I guess she was just wandering the wood eating the grass. But she sure did scare me. This haunting was discovered by Frank who is an experienced mine explorer. 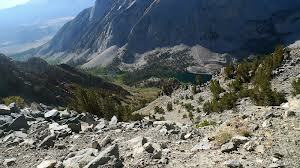 He has explored over 100 abandoned mines in the west. He recommends that the inexperienced should not do what he does because often these mines are falling apart and dangerous. But what he experienced in two of his latest explorations goes beyond this usual danger--for he encountered something otherworldly. He captures both these events on the two videos below. In the summer of 2013 Frank was exploring the Victorine Mine in an isolated mountain area of Nevada with his video camera when he spotted a Bore Hole outside this mine. He then explored the bottom of the mountain and found the lower mine that this hole leads to. The tunnel he discovered is the the Horton Mine. He spotted water coming out of the entrance to this mine but since it was running and not stagnant he felt it would be safe to enter this tunnel. As he walked through the entrance or what he refers to as the portal of this mine he felt this space was odd. Becoming overwhelmed he felt that he was being watched. As he moved further into the tunnel he felt cold spots and a strong sense of creepiness. He films several 40-pound chains hanging from this mine’s ceiling. His camera records one of these chains further down the tunnel from him swinging in a wide arch from side to side. Other chains in front of this one are swinging as well. He expresses that he feels a negative presence. Knowing this type of chain normally does not move even when a man brushes passed them Frank understandably freaks out and returns to the entrance and leaves. Here is the short video, which is 3 and a half minutes. It shows these chains moving. A year later in 2014 Frank decides to visit the Horton Mine once more. He is curious to see if something else will happen. In this video he first films the area outside of the Horton Mine then he enters the tunnel. He has found out more about the mine’s history and shares it as he walks further back into the shaft. He notes once more that this tunnel has a very strong creepy feel to it. He feels as if something is warning him to leave. The Horton mine was used in the late 1970s and early 1980s as an ore pass. Ore was dropped down the 900-foot Bore Hole from the Victorine Mine on top of the mountain. It was then conveyed on a shute that dumped it into motorized tramcars that carried it out. So Horton was used as a transport shaft. This operation by-passed having to carry this ore the long distance down this steep mountain. As Frank moves further back into this tunnel he films a strange mist and he begins to hear the dripping water that feeds the small stream at his feet. He reaches the back of the tunnel where he sees the water pouring down from the Bore Hole. As he explains how the operation worked faint voices can be heard talking above the sound of the running water and his voice. He does not note this so I wonder if he heard what I heard. Faintly at the 6:20 mark and then they get louder at the 6:35 mark. After he films the machinery and explains how it all worked he walks back down the tunnel toward the entrance. At this point his video camera records sounds that frighten him--these begin at about the 7:46 mark-- to the point where he panics and quickly runs out of the shaft. He feels a sudden blast of cold air as he hears these ghostly sounds. They are clearly recorded. There is the distinct sound of people talking and machinery moving--then a two-alarm sounds. Frank states he will never go back in the Horton Mine. One has to wonder if the running water and minerals in this mine contribute to this haunting. This second video shows his return visit in 2014. It is slightly longer--8 and a-half minutes--but hearing the ghostly sounds at the end make the wait worthwhile. There are several versions of this tale told across America. This account is from the east coast. An hour before the clock had struck twelve and now it was January 1, 1952. The three young couples were in a festive mood for they had been drinking. One husband, Bill Gardner volunteered to drive the others home since he had not been drinking except for a few campaign sips to toast the New Year. The road ahead of their car was deserted but Bill became concerned when he saw another car appear--seemingly out of nowhere. It was traveling straight down the middle of the road. Bill was worried it was going to hit them head on but in the nick of time he was able to cut sharply to the right. 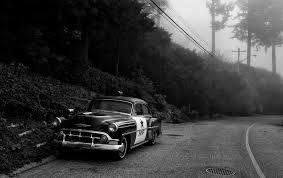 As he hit a curve his car crashed down a steep embankment. Bill climbed out of his car amidst the dust and smoke. He was bleeding but he managed to inspect the condition of his passengers. They were all pinned in the car. They were hurt but still alive. He started to climb up the hill to get help. As he reached the highway he saw a man standing near the edge looking down. The man approached him and stated his name was Benjamin Prudden from New Haven. He offered to give Bill a ride to the hospital. Just before Bill fainted he heard the man say he would send an ambulance back for his friends. Several weeks later, after Bill had recovered from the accident he went in search of Ben to thank him for saving his life and his friend’s lives. With inquires he was told a family by the name of Prudden lived in Derby. He borrowed a car since his was totaled and drove there. He asked at a shop where he could find a Benjamin Prudden. He received some odd looks but the shopkeeper offered to show him. Bill inquired if there might be another man by the same name, he was told no. The shopkeeper was not surprised by his story about the stranger who helped him in the early hours of New Year’s Day. 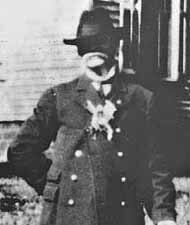 He was the 3rd person that had claimed to see Benjamin Prudden since he had died 45 years before. The shopkeeper mentioned that Ben had lost his life on the same curve Bill’s car had veered off of.